For inquiries about joining a choir, or any questions related to Sacred Music and its relationship with the Mass, contact Mr. Jacob Flaherty at flaherty.allsaints@gmail.com or at 612-801-5467. 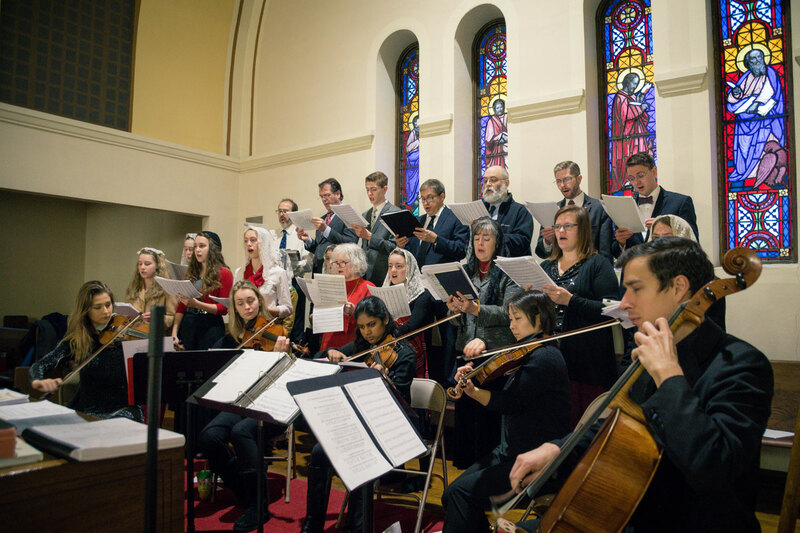 The Church of All Saints strives, in all aspects of its Sacred Music program, to live out the mission of sacred music as laid out by Pope St. Pius X over a century ago – to glorify God and to sanctify and edify the faithful. Learn about the sacred music program on September 15th at our Choir Gathering. This ensemble is dedicated to the singing of Gregorian Chant ordinaries, sacred polyphonic motets and Mass Ordinaries, along with hymns and descants. The music of Palestrina and Victoria are featured most prominently, but the choir sings music from a variety of other composers and time periods. The choir rehearses on Thursday evenings from 7:00 – 8:30 pm and again from 9:45 – 10:20 on Sunday mornings prior to the sung 10:30 Mass. This choir sings most Sundays from September through June along with some Holy Days, most especially All Saints Day (11-01-18), All Souls Day (11-02-18), Christmas, Epiphany (01-06-19), and the Triduum. New choristers are welcome; simply drop the director an email or a phone call. After that, a time will be arranged to meet with you, determine your vocal range and musical independence, and get some sense of your musical experience. An ensemble of around 8-16 voices, this choir endeavors to take on more complex pieces, particularly from the Renaissance era. The ensemble generally rehearses twice a month before it sings for a given Mass. Some Feast Days on which this choir sings include Ash Wednesday (3-6-2019), the Annunciation (3-25-19), Ascension (5-30-19), the Assumption (8-15-18), the Immaculate Conception (12-8-2018), as well as some Sundays throughout the year, including joining forces with the other ensembles at the parish’s celebration of the Feast of Ss. Peter and Paul on June 30, 2019. 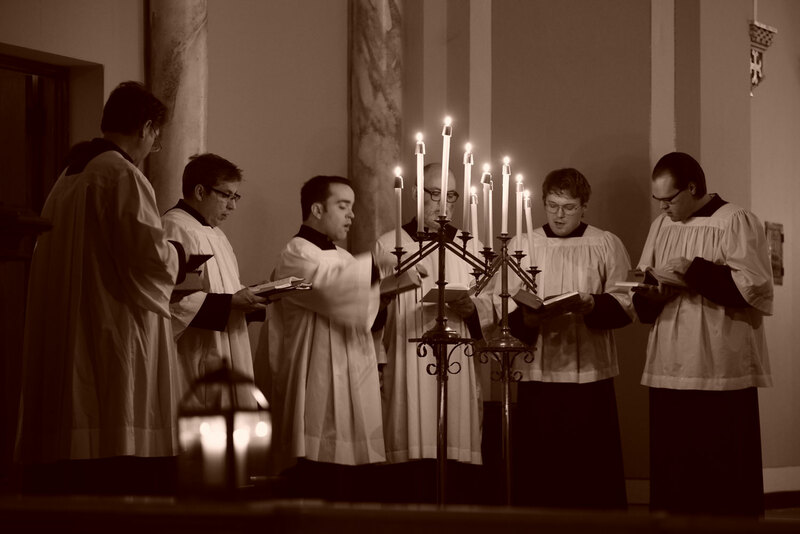 Specializing in Gregorian Chant, this ensemble focuses most prominently on chanting the complete Propers (Introit, Gradual, Alleluia/Tract, Offertory, Communion) for each sung Mass. All members are generally also members of the full choir, but not necessarily. Besides singing all of the Masses in which the Chorus Omnium Sanctorum sings, the St. Gregory Schola Cantorum also sings on these Feast Days: Christmas Matins and Midnight Mass, the Presentation (2-2-2019), the Chair of St. Peter (2-22-19), St. Joseph (3-19-19), Tenebrae of Holy Thursday, Good Friday, and Holy Saturday (April 17, 18, and 19 2019), St. Joseph the Worker (5-1-19), and the Nativity of St. John the Baptist (6-24-19). New members are welcome; simply drop the director an email or a phone call. After that, a time will be arranged to meet with you and get some sense of your experience with Gregorian Chant. All Saints is blessed to have a thriving homeschool co-op and four children’s choirs there-in, separated by age and gender. The goal of the instruction in each of them is to instill in the children a love for music, an understanding of basic vocal production, how to create a beautiful tone, a method for how to read new musical scores, and a knowledge of and love for the foundational repertory of the Church’s Sacred Music.